Cronaca Familiare (Family Diary) is based on the novel by Vasco Pratolini, which tells the story of two brothers (Marcello Mastroianni and Jacques Perrin) who are brought up apart from each other at their mother's death, then brought together by difficult family circumstances. Once described as the "classiest male weepie ever filmed", Cronaca Familiare is an exemplary adaptation of the semi-autobiographical Vasco Pratolini novel Two Brothers, and won Zurlini a shared Golden Lion at the Venice Film Festival. Marcello Mastroianni gives a sensitive, finely judged performance as Enrico, a struggling journalist in the Rome of 1945. He receives a phone call informing him that his younger brother Lorenzo (Jacques Perrin) has died. Enrico recalls their long and difficult relationship; he was brought up by their poor, but warm-hearted grandmother (Sylvie), Lorenzo was raised as a gentleman by a wealthy local aristocrat. Reunited in the Florence of the 1930s, Enrico becomes his spoiled brother's keeper, forever haunted by a sense of guilty and responsibility towards a man he both hates and loves. I've been searching for this film for decades, and am thrilled to finally have it, thanks to Movie Detective. It is just as strong and moving as I remembered. 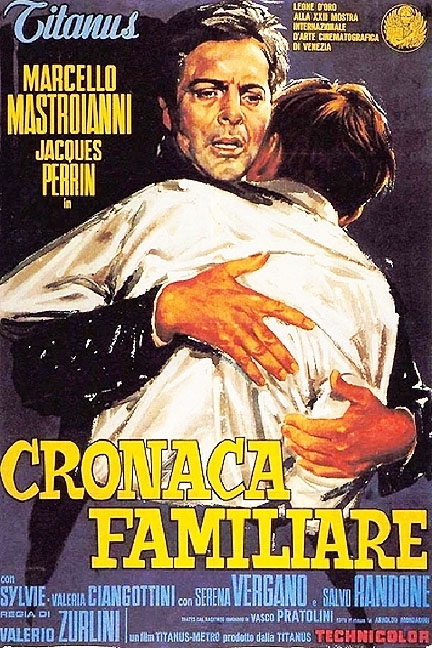 Based on Pratolini's fine, elegiac novel, Cronaca Familiare is a film of considerable emotional complexity, which explores two brothers discovery of their love despite early separation due to family circumstances and class. Mastroianni is - well, great. The film has an austere beauty. Highly recommended. Thanks, MovieDetective, for making this one available.